Dr. Gayle Shimokaji is board certified in the area of glaucoma. She trained at UCSF and California Pacific Medical Center in San Francisco and did glaucoma research with laser surgery. Dr. Shimokaji displayed a glaucoma poster and lectured at the Academy of Ophthalmology on glaucoma research. Dr. Shimokaji performs the most updated glaucoma care including comprehensive diagnostic testing and followup care. Gayle Shimokaji M.D. is an experienced ophthalmologist with over two decades of experience diagnosing and treating glaucoma. She has selected from the most current proven equipment and methods. While the vast majority of our glaucoma patients do well with medical therapy alone, she have performed hundreds of glaucoma laser surgeries and incisional glaucoma surgeries as well. Dr. Shimokaji uses specialized lasers (YAG, SLT and Green) and operates with staff of the surgery center specializing in eye surgery. Glaucoma is a progressive wasting away of the optic nerve, usually associated with higher than normal eye pressure but not always. The condition responds by stabilizing or progressing very slowly in most patients who receive treatment. Even patients with "normal" eye pressure (21) can develop glaucoma. The most common type "chronic open angle," develops when pressure within the eye reaches a level too high for the health of the optic nerve. Over time, the optic nerve wastes away and may eventually cause blindness. The optic nerve is similar to a TV cable carrying images from the eye to the brain. High pressure presses on and damages the nerve fiber layer and blood vessels in the optic nerve. As the nerve wastes away vision is lost imperceptibly at first then more rapidly as time goes by. Glaucoma can be separated into two broad categories, "Open Angle" and "Angle Closure (narrow angle)" Glaucoma. Open Angle Glaucoma, the more common condition, occurs when normal internal drain (trabecular meshwork) in the eye is impaired and pressure builds up. Open Angle Glaucoma usually develops slowly and usually has no symptoms until a substantial part of the vision has been permanently damaged. In Angle Closure or Narrow Angle Glaucoma, the iris physically obstructs the internal drain of the eye. The iris floats over the drainage area and clogs it. This type of glaucoma usually develops suddenly. Emergency treatment is required for this acute and often painful condition. Many cases are prevented when the narrow angle is detected during a "routine" eye exam, before there actually are symptoms. Laser treatment at this time prevents most cases of a glaucoma attack. This condition is almost the same as open angle glaucoma, except that the patient suffers nerve damage at pressures that would be considered normal, and have never had pressure above normal (normal is 21). For these patients we target very low pressures as the goal of our treatment. Routine Eye Examinations! Most cases of glaucoma are unsuspected! They are usually detected in the course of an eye examination for done for some other reason, such as "routine" exams, cataract evaluations, or even follow-up of a patient with macular degeneration (an unrelated condition). It is a fortunate discovery, because the worst cases of glaucoma are those that go undetected and untreated. This is one of the reasons we recommend a schedule of periodic eye exams even for individuals with presumably "healthy eyes." 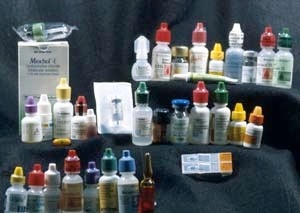 There is no single test for glaucoma. The diagnosis is made by evaluating the patient from a number of perspectives, using specialized instruments. Tonometry measures eye pressure.Dr Shimokaji uses applanation tonometry, because it is the most accurate method available. Applanation tonometry is quick and painless. There is no air-puff; puff tonometry and tonopen are less accurate. 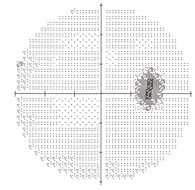 Pachymetry measures the corneal thickness ultrasound (sonar). Thin corneas may predispose a patient to glaucoma, whereas thick corneas may occasionally be considered somewhat protective. Gonioscopy This is what your physician sees when he performs gonioscopy. He is looking to see how much dark pigment is clogging the drainage meshwork, and whether the iris is floating up close enough to cause angle closure glaucoma. A special viewing lens is used and a drop of anesthetic makes the eye numb (right). 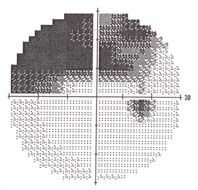 The cross-section (left) shows a wide-open angle, where the iris is far away from the corneal dome. The lens is behind the iris. Normal aging thickens the lens, pushing the iris forward. Some people inherit a narrow angle, and with aging they are particularly susceptible to narrow angle glaucoma. While Open Angle Glaucoma is the most prevalent form in the USA, narrow angle glaucoma prevails as the leading cause of preventable blindness in Asia. Dilated Optic Nerve Examination While special testing is extremely useful, it has not replaced a careful examination and assessment by your ophthalmologist. Here is a damaged optic nerve as seen by your doctor on examination (right). This patient probably has NO SYMPTOMS! 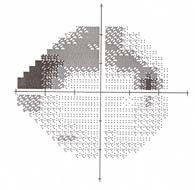 Visual field test The visual field gray-scale printout (left) corresponds to this kind of optic nerve damage. Visual field tests assess your peripheral vision. Early damage from glaucoma can often be detected by this test. Dr. Shimokaji uses the latest computerized technology to assess peripheral vision. Currently she is using primarily the Humphrey SITA 24-2 test. Both eyes are tested in 10 to 20 minutes and the visual field examination is usually repeated annually to monitor for progression of glaucoma damage. 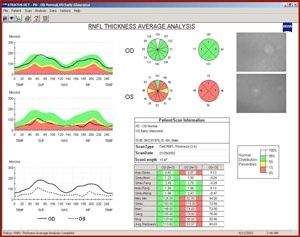 Once we have several reliable studies on a given patient, the glaucoma progression analysis ("GPA") software analyzes your visual field tests to determine whether your disease is stable, possibly worsening or getting worse. Nerve fiber analysis A scanning low-energy light measures the optic nerve and the thickness of the nerve fiber layer (the nerve that carries the vision message from the eye to the brain). This is the nerve that is damaged in glaucoma. 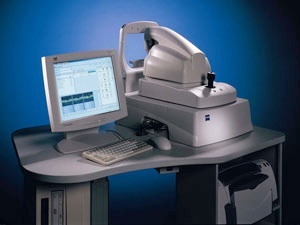 This testing is performed by state of the art "OCT", a scanning instrument with computerized image processing and analysis. The test is usually repeated annually. Optic Nerve Photography (two pictures showing progressive atrophy of the optic nerve) can still be very useful, although greater reliance is being placed on computerized imaging such as the OCT. Lowering the eye pressure has been shown to slow or prevent vision loss from glaucoma. There is general acceptance that the target for pressure lowering is lower than whatever the patient's baseline pressure has been prior to diagnosis. What is unclear, though, is just how low does the pressure need to be in an individual case. Furthermore, it must be acknowledged that sometimes maximum tolerable therapy will not lower the pressure as much as we would like. Despite these limitations, many doctors use their clinical experience, their observations of the individual patient's entire situation and the published studies on glaucoma progression to estimate a "Target Pressure." This will be the "North Star" of their treatment, and may be revised over time. Other doctors are uneasy with setting a target pressure because it definitely is not an exact science.